The H10 Sentido White Suites is an adult-only hotel which offers first class service and facilities. The hotel is situated 300m from the beach. The facilities provided for guests at the H10 Sentido White Suites include a 24-hour reception, internet access, currency exchange, laundry facilities and parking. Sports and leisure facilities include two swimming pools, sun terrace with loungers, daytime activities including yoga, Zumba, aqua aerobics and water polo. There is also boules, table tennis and archery. The hotel provides regular evening entertainment with themed nights, professional shows and live music. There is also a health and beauty centre which offers a selection of treatments, massage service, Turkish bath, sauna and a gym. The main restaurant offers buffet-style meals. The pool bar serves a selection of snacks and refreshments and is also the venue for the evening entertainment. There is also a chill-out bar which offers Shisha (traditional middle eastern water pipes, charges will apply), cocktails and teas. The accommodation consists of 200 suites which feature a bedroom, living/dining area with sofa bed, private bathroom and a balcony or terrace. Suites benefit from 32 inch LCD TV, coffee machine, minibar (local charge according to consumption), safety deposit box (local charge), bathrobe and slippers, hairdryer and air conditioning (local charge). Guests staying at H10 Sentido White Suites must be at least 16 years old. The adult only H10 Sentido White Suites complex enjoys an enviable location, near to the beach, well located for resort amenities and has a host of on-site facilities to help you make the most of your holiday. Quiet just how we like it. Great hotel, adults only. Food quality and quantity very good. Entertainment good. Apartments on 2 stories only. The only downside - some rooms do not have a good view - overlooking the road or scrubland. Excellent hotel. Very helpful welcoming staff. Food very good and service excellent in the dining room and bars. Accommodation very spacious, comfortable and clean. The location is good for a few minutes pleasant stroll to the beach. Would most certainly recommend the hotel to friends and relatives. Fantastic hotel, where everyone treats you as a friend! Excellent. Chilled atmosphere, great food and service. 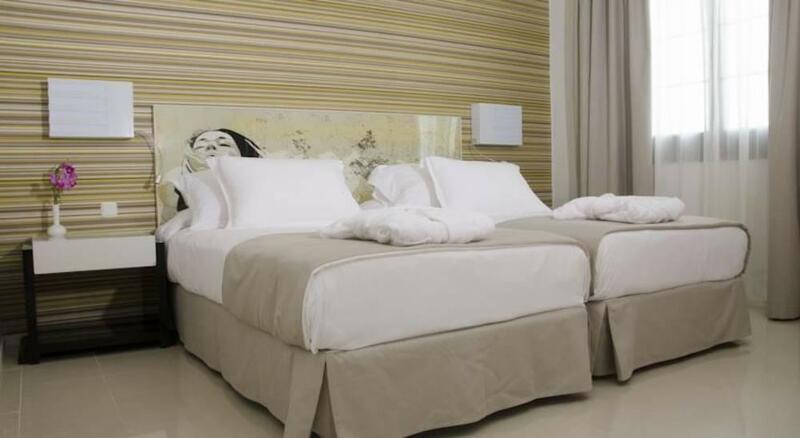 Spacious rooms, very comfortable bed, good entertainment. Minor imperfections (odd chipped plate). Whole hotel very clean. Location ideal 5 mins to beach, marina and promenade. My mother and I spent 10 days at White Suites and thoroughly enjoyed the experience. Our apartment was spacious and clean. The complex is arranged around the pool, pool bar and restaurant, so it was only a short walk to all facilities, but the apartments were still quiet in the evenings. Staff were very friendly and helpful. Food was amazing and show cooking ensured that it was freshly cooked. Despite being buffet-style it was high quality with lots of choice and the menu was varied daily. The entertainment was excellent with shows in the pool bar in the evening (small stage but excellent acts) and daily activities such as archery, rifle shooting, zumba, yoga etc etc. There are also 2 pools and sun loungers were always available, whatever time of the day we decided to swim/sunbathe (it helped that it was adults only). Our holiday wasn't without minor problems but any query we had was swiftly and courteously dealt with by the staff. They also offered to book tours, change currency and book hire cars. Transfers from airport to hotel and vice versa were well organised and efficient. I would recommend the All Inclusive option as it was well worth the money. Also, it's only a short walk from a marvelous beach, the marina and shops. Highly recommended. We would definitely go back. You are treated so special by each and all members of staff; they're like a friend! Very good in general but sometimes not enough staff in bars etc. Generally good but spoilt by a few problems. Firstly the room we were given smelt fusty and felt damp which caused us to complain and then given a room that was fine but that situation should not have occurred. Secondly the service in the bars left a lot to be desired not due to the staff who were first class but lack of staff, having to wait to order drinks. Thirdly, the entertainment was mostly held in the bar/reception area which wasn't ideal as there wasn't enough tables to seat everybody. The food was good, plenty of choice freshly cooked while you wait but could do with plates being warmed for the hot food. The pool area was lovely, nice comfy sun beds, towels provided and very quiet and relaxing with it being adult only. Everywhere was clean and the gardens were well kept. Room was clean, spacious and beds extremely comfortable. Grounds are well maintained. All inclusive option well worth doing. Food excellent lots of choice and drinks are all named brands. Had a fabulous time could not fault we recommend highly and go back again. Brilliant! Everything was perfect. We have been there before and returned because it has everything we are looking for. Small and friendly. Excellent accommodation, beautiful surroundings, Staff really friendly and helpful, high quality food. I personally think that the White Suites could do with a little tlc. It needs a little bit of a refurbishment re painting etc. The towels could also do with an update as they are very thin. Facilities, food etc were very good so no improvement needed there. Staff were also very polite and friendly. Fantastic adults only hotel with great facilities. I can fully recommend this lovely hotel, its our third visit in 18 months and are already planning our next visit. The hotel is very chilled out, the staff are lovely as are the rooms - very large with extremely comfortable beds. We have stayed all inclusive and you can always find something tasty, I can find no faults other than the sun bed wars that seem to go on each day with the guests - it has never affected us, we have never reserved a bed and have always managed to find one. (It's the hotel policy not to reserve - quite right so!). Great hotel, staff very helpful, beds were very comfortable. Problems with sunbeds which they try to address with not much success. Overall a good holiday and would go again. Beautiful but need more sun beds.